Microsoft this week unveiled a demo for the upcoming sim game Screamride. 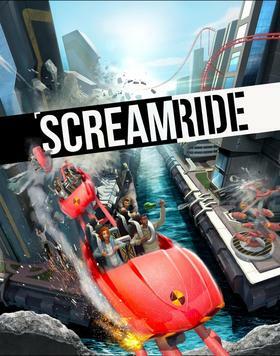 At last year’s E3 Screamride was one of those little surprise games that looked like it had lots of character, and could end up being a nice diversion game this year. So having a demo show up this week was a great way to get a feel for how the game will play. So I gave it a go last night and thought I’d offer up my two cents. The demo is relatively limited – featuring one level of each of the three styles. But that’s honestly not a terrible thing – it’s a demo after all. It does show a good idea of the potential scale for the full game. It reminds me a lot of other puzzle based games – Trials comes to mind. In order to progress through the levels, you’ll need to earn enough medals to open up the further ones. Which means finishing as many internal challenges within each level as possible to increase your score. Some of the challenges are pretty easy, others will definitely require a bit more trial and error. So far then, nothing particularly outside of the norm for a puzzle game. Which brings me to the actual gameplay now. Screamride has three different style levels – Screamride, Demolition and Engineer. Each has different gameplay mechanics behind them. Screamride levels put you in the shoes of the riders of the roller coasters. Your task is to ride through the track as fast as possible, building up turbo and balancing as much on two wheels as possible. Demolition is just what it sounds like – you’re given a swinging ride, to toss the cabin at the buildings. You have to do as much damage as possible to the structures, with the limited cabins you’re given. Finally, Engineer has you build those roller coaster rides, making them as exciting as possible with your pieces. Each mode does feel unique and presents different challenges. That said though, it really deosn’t strike me as a full, $40 priced title. It’s much more akin to a downloadable title, that would fit perfectly on the Xbox Live Arcade. Of course, Microsoft has forgone the distinction between Arcade titles and not, so it’s just another game. I’m not going to write it off entirely now, since this is just based around a demo, but it does feel a little sparse. I likened it to Trials earlier – I do see a lot of similarities between the games. But Trials was $10 cheaper. As for right now, it’s a game I’m still interested in, but it might be one I wait for a while.